We let the lies get to our head. I am not pretty, I will never be good enough, this is an impossible job, just to name a few. As women, I feel as if it is all too easy for us to start to overthink things. Something negative will be said about us, or something does not go entirely right about our day, and we start to let these feelings of doubt and insecurity seep in like poison. With these feelings, the devil starts to whisper hurtful ideas to us, imprinting them on our minds and hearts until we start to believe them to be true. “The thief's purpose is to steal, kill, and destroy. My (God’s!) purpose is to give them a rich and satisfying life”. God does not want us to buy into the lies the devil whispers to us day in and day out. He wants us to lead rich, fulfilling lives where we feel powerful, confident, and assured of ourselves and where we stand in Christ Jesus. Jesus offers these assurances to us right from His word. We are blessed by His hand (Psalm 139:5), His hand will guide us, His strength will support us (Psalm 139:14), and my personal favorite, We are being transformed into his likeness (2 Corinthians 12: 9-10). The next time you find yourself buying into the devil’s lies, use these assurances straight from the Word of God to combat them! The devil cowers and flees in Jesus’s name all the time in the New Testament. We have that power too! We just have to be bold and confident in His Word, speaking the Scriptures in His name to send the devil fleeing from our spirits, along with all his lies! So the next time you start to feel down about yourself because of the lies the devil has been whispering to you, remember as women we are creations of Christ, bought and redeemed by His blood. The devil has no power over us! Thank you for the encouragement today and for reminding us who we should put our focus on. The devil has no power over us, we are free in Christ! Wonderful post! Thank you for commenting. I am glad this post gave you some encouragement. A good reminder to use our Sword against the enemy's lies! Yes! The Sword of the Spirit is the best weapon we have! What a great reminder, thanks! I do often have those negative thoughts about myself. Next time, I'll have to remember to combat those lies with Scripture. I do have negative thoughts about myself as well. It is a hard thing to learn to combat these lies with scripture, but I think we will be better off once we learn this habit. Great word Emily! 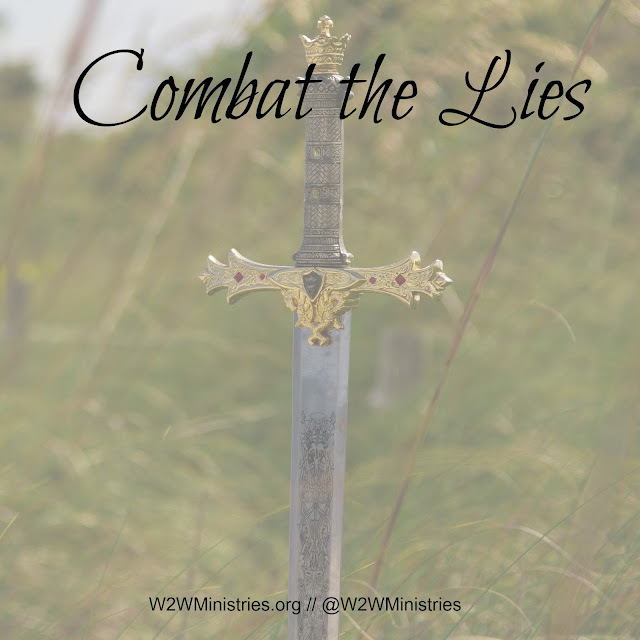 We often need this reminder to take our thoughts captive and combat those lies. Agreed Jenifer. Our minds were made for God's purpose, not to be the devil's playground.